I already had most of the parts before even considering this project, except for the drop-ins and pressure switch. Here is the result, with both lights turned on in high mode. At the handlebar end is the tape switch, which I have zip-tied, but could easily glue on. At least with my riding style, my thumb is near the tape and I can easily press it when braking with my other fingers. 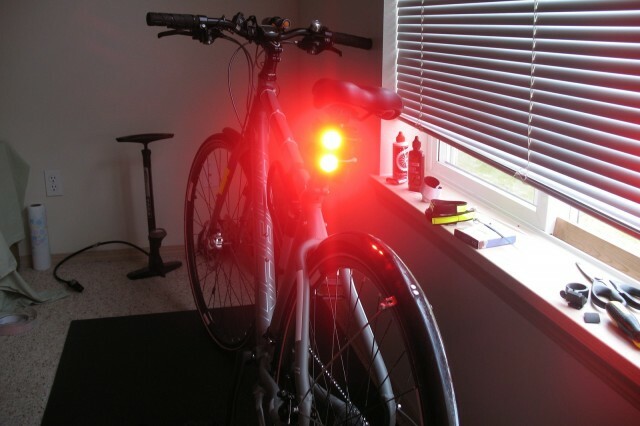 There are times when I only use my rear brake (the right lever) but would still want the light to toggle on. I will admit that having the switch there makes it awkward at times as gripping the handlebar turns on the flashlight, but as most of my riding is done in the city with my fingers always over the brake lever ready to stop, it’s not a huge deal. For others, of course, this solution may not work. In my estimates, on high mode, the lights are probably putting out about 300 lumens each. 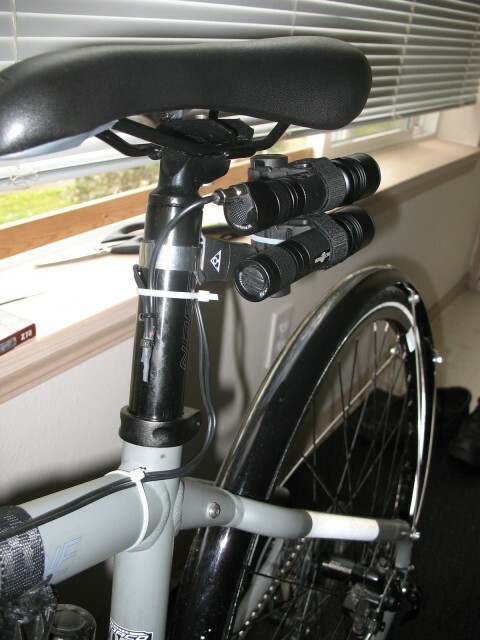 They work great for daytime visibility, but at night, I definitely have to turn it down to medium (I also have a slightly blackened diffuser lens to lower output), if not, it’s extremely blinding for drivers. I also avoid strobe/flashing modes at night as I believe it just makes it more difficult for drivers to judge distance.